Tom's parents think he plays video games too much and send him to spend the summer at his grandfather Joe's farm in a little town. Unexpectedly, Tom helps breathe new life into the run-down farm and even save it from a greedy developer. 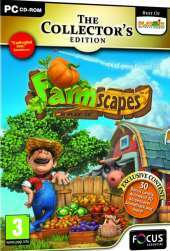 Farmscapes is a puzzle/simulation game with a bit of an adventure storyline, similar in gameplay to other Playrix Entertainment games, such as Gardenscapes and the Fishdom series. Virtual money won in puzzle levels is spent on renovating the farm. Exactly like in Gardenscapes, there are always three kinds of an object (for example shed, dog kennel, lanterns, gazebo...) to choose from and after four objects are bought, the next four appear. However, virtual money is won through match-3 levels, like in Fishdom. The game also contains hidden object levels, but they don't yield money and are rather used to push the story forward. Another kind of gameplay found are short object puzzles in the farm view itself, similar to point-and-click games. The game also has its system of achievements, related both to storyline and to puzzle gameplay. All achievements can be viewed as trophies in farmer Joe's house.